Here at WhatShed we have put together top ten lists on pretty much every kind of garden structure that you can get. We have looked at the best plastic shed retailers, the wooden shed retailers, the metal shed retailers and if you come back to us in about 20 years. We will probably have done the top ten Mars meteorite shed retailers as well. Anyway today we are putting it all together and looking at the best overall shed retailers. We are looking at each retailers complete selection and then seeing who offers the most diverse selection of sites. The retailers we have listed down below make up for close to 100 percent of the shed sales in the UK so these are not just some random retailers we have picked. We cannot stress enough how hard a list this was to put together, but it should help you out when it comes to making your next wooden, metal or even plastic shed purchase. 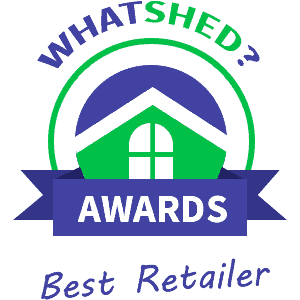 These are the top shed retailers in the UK so putting them in an order was really tough and actually the top 5 all came close to taking the number one spot so this by far is the hardest shed retailers list we have had to do! see that Buy Sheds Direct feature in the top five regularly. Now one of the main reasons that we really like Buy Sheds Direct is the way that they do actually let you look at their sheds all lumped into one place. Now of course if you want you can get a little bit more specific by clicking look at metal sheds for example. But they do let you look at sheds of a particular size in all different materials. This is great, especially if you are more bothered about the size or price of your shed than what it is made of. There is just a ton of sheds to look at here so be sure to grab a cup of coffee before you start. The site is very easy to use and most of the customer reviews, considering how many sales they have are actually very positive. wooden sheds part of their site is just incredible. We love how they have sheds not just in all different sizes, but at different prices as well. This is a site that is ideal for people of all budgets. Another thing we really like is the way that many of the sheds that Garden Buildings Direct sell, especially their BillyOh range, let you tinker with them. By this we mean they let you change things like the flooring, shelving, colour and things that will let you put your own stamp on it. The site has dedicated sections for their metal, plastic and wooden sheds and as there is so much choice it may be a little daunting to some. Still though, we do not feel that a huge choice is a bad thing. their garden sheds part of the site. Here you can look at just an incredible amount of sheds. Honestly it would take you a long time to see all that they have, but Shed Store do have a great search function that allows you to be a bit more specific with your search. So if you know for a fact that you want a metal shed that is 8 X 8 then you can specify that. At the same time, you can just put in a size or a price range and then see all that they have that way. not just wooden sheds, but you can select things like tongue and groove, overlap cladding or many other styles and designs of sheds. It is very impressive and for those of you who know exactly what kind of shed you want. You are going to find using this site very easy. Those who are a little unsure and want to browse will not have a hard time, but it will take a while to see all that they have. is workshops which we have seen on a few other sites, but here they are part of the actual sheds section. As well as this though they also put bike sheds in here which we thought was a nice touch. We had no trouble using the site at all and they explain the ins and outs of each shed very well. Before you jump into their wooden, metal or plastic section we will suggest that you have a look at their sale section as Sheds.co.uk is one of the best when it comes to having regular sales and deals. sheds of which there is actually a decent amount, but we do get the impression Taylors Garden Buildings are more about their wooden sheds. Still if plastic or metal is what you are after you will not be disappointed with their selection. The site may be a little overwhelming for those of you, but if you love a huge selection and do not mind to do a little looking around, you are going to have a lot of fun looking at the great selection they have here. this is the same for most other retailers. When you go to their sheds section, you can click on wooden, metal or plastic and from there you can then get a little bit more in depth with what you are looking for. So for example if you click wooden sheds, you can then select a size and price range to you can make it a bit easier to find something that will be ideal for your wallet and your garden. , gazebos, workshops and other garden structures here. But you just click on the timber, plastic or metal sheds section and you will not have to deal with anything else. We really like how they let you select the size, brand and price range that suits you as this can save you a whole lot of time when looking for your shed. a look at those if you are not looking to spend a lot of money. One thing that we do actually really like about the Homebase sheds section is how while you can tick a box so that you can just look at the wooden sheds. You can if you have the time and patience just look through all their sheds, plastic, metal and wooden all in one convenient place. different wooden sheds on here. They also have lots of plastic and metal ones as well which is quite impressive. The issue is that Sheds World are known to sell sheds that other retailers such as Waltons offer so they work as something of a middle man. Which is kind of pointless when you can just go to Waltons and get the shed directly from them. So while this is a great site when it comes to being able to look at an amazing amount of sheds. We would suggest if you do find one you like on here. That you have a look and make sure it is not being offered directly through Garden Buildings Direct or Waltons for example where you might get it a little cheaper and most likely a lot quicker as well.